I have worked with contemporary a cappella and choral music since 2002, as a singer, arranger and leader and I am happy to get to share my passion with others on a daily basis. As a performer I am a full time member of two internationally known groups; the Vocal Jazz ensemble Touché (Copenhagen), as well as Vocal Line (Aarhus) and I also perform with several smaller a cappella groups. 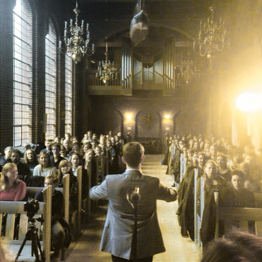 As a leader I work with choirs and smaller vocal groups in both Copenhagen and Aalborg. I hold a degree in Musicology from Copenhagen University and in june 2016 I will complete a Masters’ degree in Vocal Leadership and Rhythmic Choir Conducting from The Royal Academy of Music in Aalborg, under Professor Jim Daus Hjernøe. In 2015 I was also a part of the Europe-wide project LEO Sings -‐ diversity of singing practices in Europe.